It’s hard to argue that there’s a more valuable creative skill than an eye for the innovative and unique. Just look at some of the biggest industry disruptors of the past few decades: Uber, Airbnb, and Amazon. On the surface, these companies’ ideas were nuts: who would have thought the world’s largest accommodations company would own zero properties? Hindsight may be 20/20, but if I’d pitched any of these ideas years ago you probably wouldn’t have taken me seriously. Whether you’re building a business, writing an essay, or designing a product, sticking to the status quo kills innovation . That’s why it’s so important to keep things weird when you’re working. Non-conformity, novelty—however you define “weird,” the general idea is that it’s something that goes against what’s commonly accepted. Building and opening a new hotel isn’t weird, but connecting users with people looking to rent out their home certainly is—or at least it seemed strange years ago. Research shows that we’re better able to store novel events in our memory. Why? Weird experiences cause a release of dopamine (a neurotransmitter related to motivation) in the part of our brain responsible for discovering, processing, and storing new sensory impressions. That hit of dopamine not only makes us feel more motivated to explore, but new studies have shown it also creates a stronger connection to long-term memory. Our brains physically remember the weird and atypical. On a psychological level, we also give strange ideas more value than those that support what we already know. Weird ideas and elements not only stick with us, but we give them more cultural value than those that just confirm what we already know and accept. To a point. Does this mean that you need to go out of your way to go against all social norms to be recognized? Not really. After all, certain ideas or theories are common for a reason. Our brains take in a huge amount of sensory information at all times, which is why we’ve developed filters that help us judge new information and pick out what’s important. A 2012 study from Google (opens PDF) shows that new visitors to a website judge its functionality and aesthetics within 1/20th–1/50th of a second. In about as long as it takes to blink your eyes, your brain has taken in, filtered, and decided what’s important. This all ties into the idea of cognitive fluency and how easy our brains find a task. Typical and common elements are easier to process because we’re used to them. They feel simple to us. Too many complex or atypical elements, and your brain assumes this is a potentially hard task and you’re likely to move on. 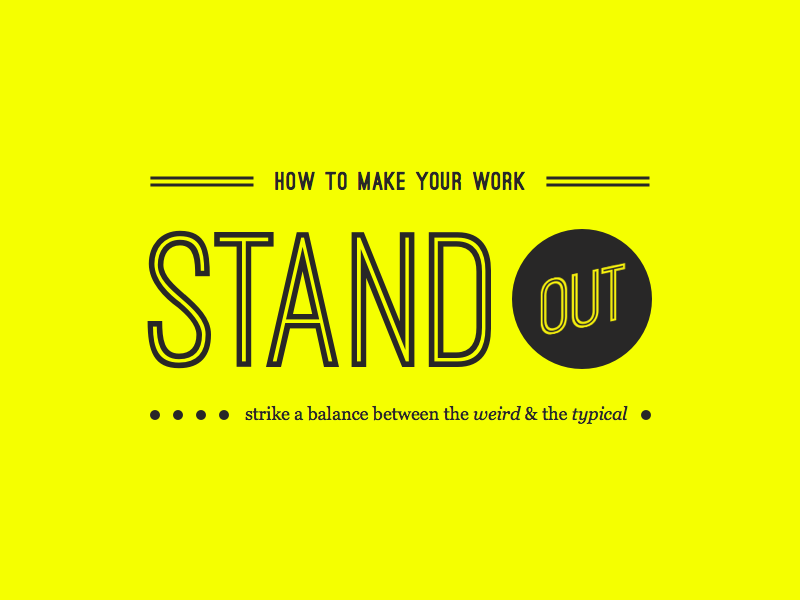 Striking a balance between the weird and the typical is key to making your work stand out. Copying is safe. It allows you to latch onto ideas that have already been widely accepted. But it’s also a trap for mediocrity. Psychologists recently connected the idea of cognitive disinhibition with innovative creativity. Cognitive disinhibition is the failure to ignore information that’s irrelevant to current goals. Those same filters that help us parse through sensory information can also hold us back from reaching that aha moment of creative insight. While some of this comes down to genetics, there are proven ways to let in seemingly unimportant and weird information. Practices such as daydreaming, letting your mind wander, or taking a walk all do the trick. However you do it, the idea is to get into a place where those filters become relaxed and new, unusual ideas float in. In the 1930s, German psychologist Hedwig von Restorff discovered that we remember things that stand out more easily. Take this list of words, for example: apple, car, tomato, dog, rock, banana, pencil, Lady Gaga, helicopter, cat, cheese. Which do you remember? I bet it wasn’t tomato. In the context of the list, Lady Gaga stands out like a sore thumb—it’s atypical within the context of the list. 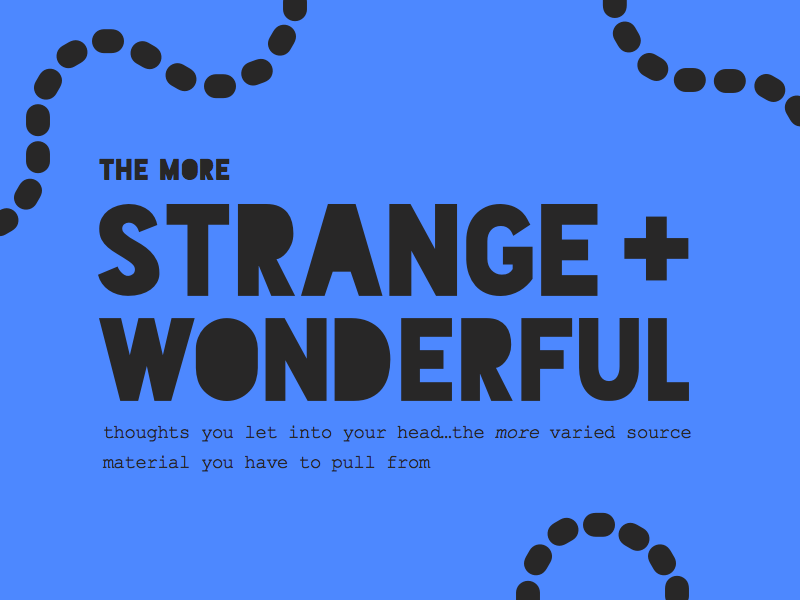 The weird and strange are much more memorable when put in the context of familiarity. Too much out there at once, though, and your unique ideas get lost in a wash of weirdness. 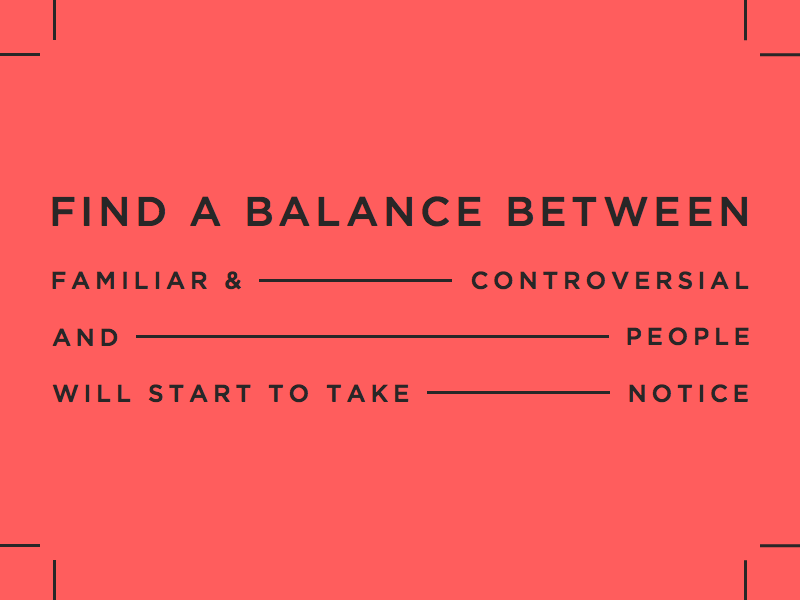 Find a balance between the familiar and the controversial, and people will start to take notice. Self-censorship is a major barrier on the road to creating unique and memorable work. Will people laugh at us for our ideas? Will they get mad at what we’re creating? Deferring to self-censorship means denying the world of who you truly are . 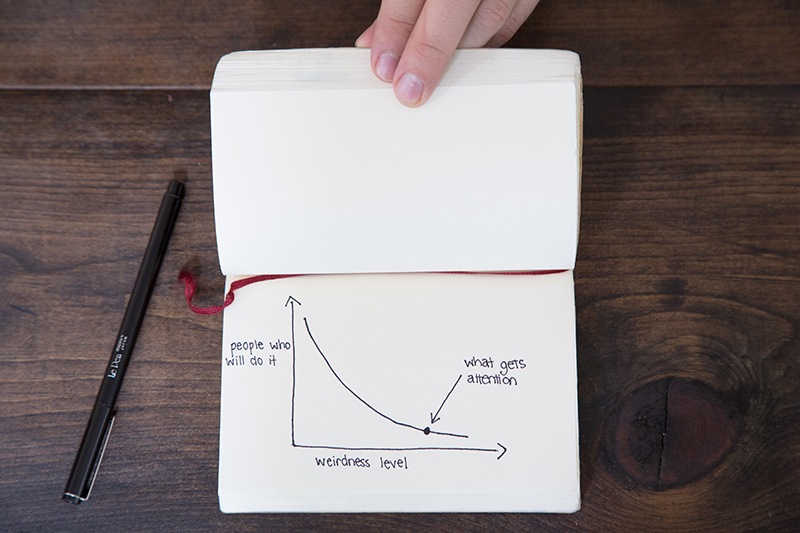 Embracing your individual idiosyncrasies can go a long way in boosting your creative output. Whenever you find yourself pulling punches, ask why. Then trying doing the opposite. Truly innovative and creative ideas come from divergent thinking —connecting the dots where others haven’t. The more strange and wonderful thoughts you let into your head, the more varied source material you have to pull from. Take this story from Stanford professor and author Robert Sutton about a software company he consulted for: when coming up with new ideas, the company would take 2 stacks of flashcards and write technologies on 1 and industries on the other. Then they’d shuffle the decks and pull 1 from each pile. More often than not, the combinations were a little too obscure. But the practice of combining the seemingly unconnected sparked innovation and creativity across the company. 5. Reward success and failure. Punish inactivity . Creating your best work possible means embracing strange ideas. Those who push boundaries and create work that we revere and acknowledge often fail more than they succeed. More than just keeping score, this is about trying. Embracing your own quirkiness means putting out work constantly. Let your weirdness be your calling card . And remember, every new innovation or trend started as someone’s weird idea. Jory MacKay is the Editor and Content Strategist at Crew—a marketplace connecting people working on projects with handpicked, vetted designers and developers.